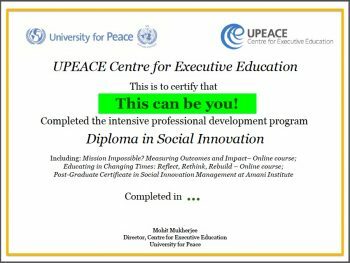 Did you know that after graduating from Amani Institute’s Social Innovation Management Program you also become eligible for the Diploma in Social Innovation by the United Nations Mandated University for Peace’s Centre for Executive Education, based in Costa Rica? Twenty Amani Fellows from places like Italy, Kenya, Canada, Brazil, and Switzerland who have joined the Amani program in the past five years have also successfully completed the two additional online courses required to get their UPeace Diploma, taking the opportunity to include this UN certification in their CV. After completing the 9-month journey with Amani Institute for the Post Graduate Certificate in Social Innovation Management (5 months online, and 4 months of “Immersion” in Kenya, India or Brazil), you can choose two different UPeace online classes which are most applicable to you. For example, you could learn how to create a monitoring plan for the M&E of a project or program (Mission Impossible? Measuring Outcomes and Impact), or how to draw a comprehensive social media plan that is cause-oriented (Social Media for Social Innovation). Or, you could understand your own personal strengths and how to use them best to your advantage (Designing Your Life: Innovating from the Inside Out), or how to apply design thinking methodology in the field of education, examining the challenges facing educators in light of changes in society, information flows, advancing technologies (Educating In Changing Times: Reflect, Rethink, Rebuild). 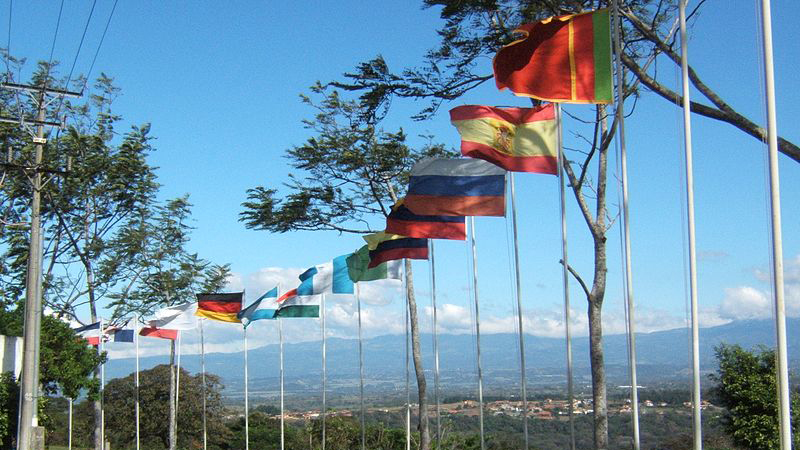 All of the UPeace courses are 4-week online courses, including videos, live webinars, articles and forums for discussions with faculty and peers from all over the world and are offered to Amani Fellows at a special discounted fee of $395 per course, instead of the normal $595/895. Rita did the Negotiations and Impact Measurement courses: “The teachers were amazing, both were super attentive and engaged, they responded to emails anytime and were very knowledgeable. The learning program was also very well taken care of in terms of content, materials and activities”. Milagro, from Argentina, defined it as “a wonderful experience”. Francesca remained in touch with not only the instructor but also with peers from Latin America who are exploring digital education in prisons and remote areas, so they could share learnings and progress on their respective projects. Yvonne took the course in life design and said, “I think it is great to do (the UPeace program) a few months after Amani Institute’s program to recap some of the learnings and continue to build upon the inner journey elements. The benefit of the courses depends largely on each person and the time and energy commitment they put into it”.